One small farm puts a very different business idea into place. Whenever regular visitors come to Joe and Jane Blystone’s farm, their good buddy Hank is quick to come out and greet them. The visitors have gotten used to a little habit of his. He sometimes will sneak up from behind, quickly run by, and nip at their heels. Hank can’t help that. It’s in his genes. On Blystone Farm, Joe and Jane have created an unusual lifestyle and business on their 83 acres. This is a cattle farm, a slaughter house, a butcher shop, a meat market, and a restaurant. 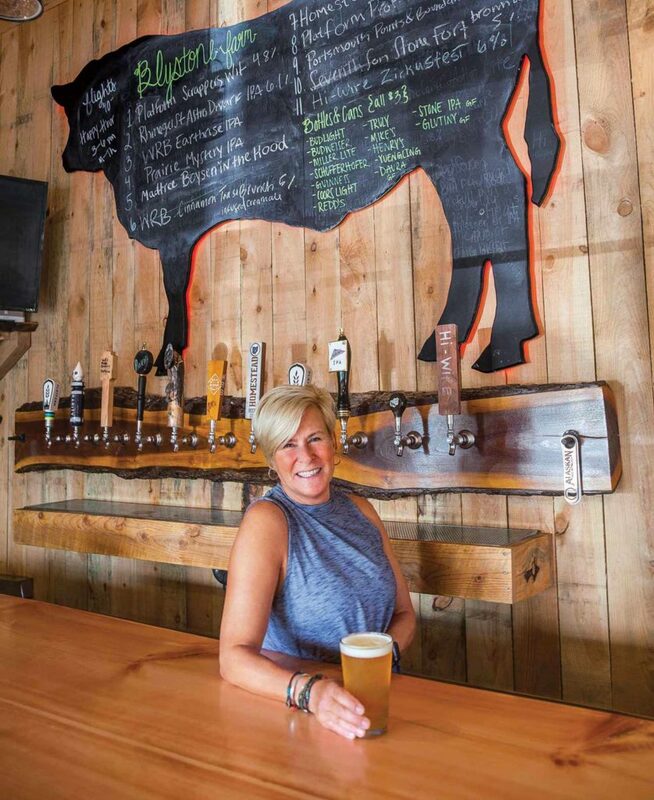 This is a place where people can come to enjoy the country, breathe some fresh air, kick some dirt, then drink local beer and eat a really good steak. 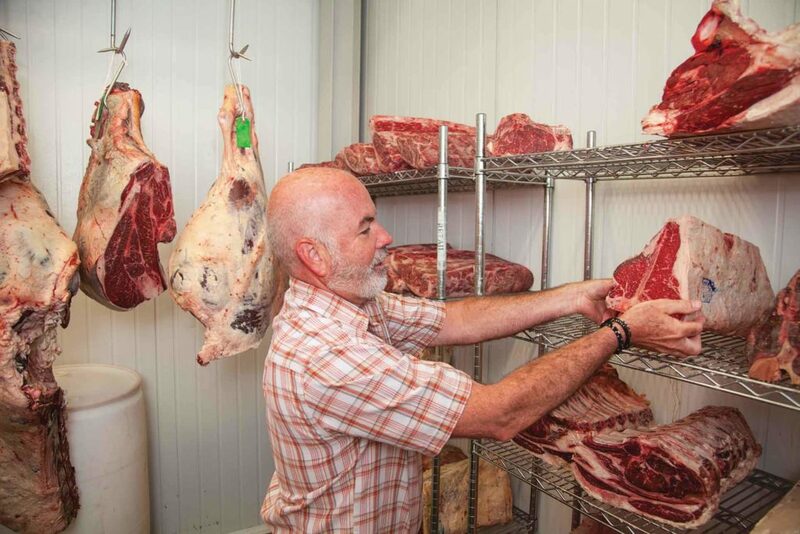 Joe ages his beef three to four weeks, something he says gives his steaks a great flavor. “There’s nothing like it anywhere that I know of,” says Joe, who did not grow up on a farm. His story on this land started in 1999 when he married Rebecca, who grew up here. She had a modest herd of sheep, 24 ewes in all. When Joe joined in, they expanded that to 450 head, and would sell about 1,000 lambs a year to members of ethnic groups. Those buyers wanted to slaughter lambs on the farm, and that soon led Joe to build a packing floor here in 2004. Rebecca passed away in 2008, but Joe kept expanding the business. After he met Jane a few years later, he began slaughtering cattle and hogs and opened a retail store on the farm to sell meat. The meat case, just a few feet in front of the processing area, is as good as any found in a big city, and that explains why many people make the drive into the country just to buy their meat. Neatly displayed under glass are much more than dry aged steaks. There are grass-fed bison cuts, bratwursts and sausages (ground, stuffed, and seasoned right here), Amish chickens, pork chops and tenderloins, and much more. 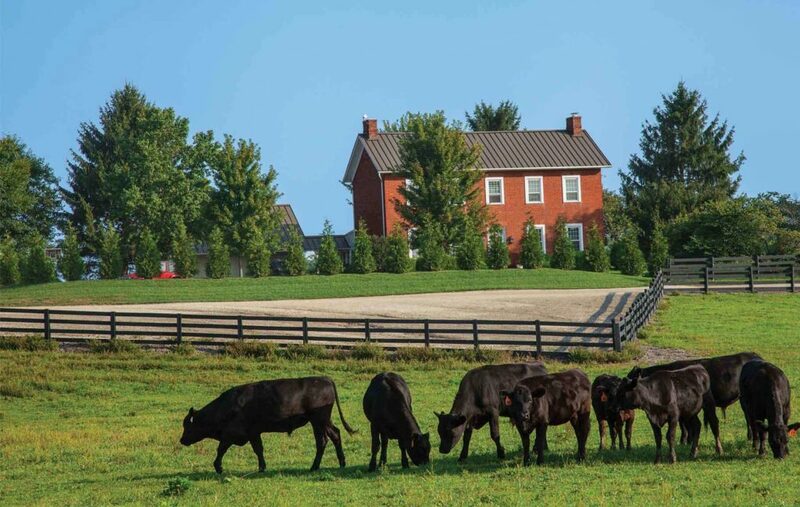 Blystone Farms also sells Wagyu beef, a type of meat with origins in Japan. “It has a buttery type fat that melts at a lower temperature than domestic beef. It’s more flavorful,” says Joe. Jane Blystone with a freshly poured brew. All of the beers on tap are local, all from small Ohio breweries. Joe started out by talking with meat scientists at the local university. “Their first reaction was, ‘It won’t work,’ “ he says. Joe wasn’t deterred. “I had to learn and learn fast,” he adds. Joe found someone in Ohio who had a slaughterhouse, paid him to come for a few weeks and give him and his employees a crash course. “I called him and said, ‘I need to know how to slaughter cattle and hogs, and I needed to know it yesterday,’” Joe says and laughs. The Blystones’ old brick farmhouse might soon become a bed and breakfast. The changes and growth keep happening. “I’m always an overachiever,” says Joe. “I figure if I can make more money and can employ another person, that’s the way I think of business.” Last fall Joe and Jane planted their first patch of pumpkins; next spring they will plant a corn maze. The two just finished a new barn—a pavilion to host weddings and other events—and they plan to soon turn their old brick farmhouse into a bed and breakfast. Have they made mistakes? Joe and Jane look at each other, knowing what the other is thinking. “I made the mistake of going into the restaurant business,” says Joe with a laugh. Running a restaurant is a notoriously difficult business, something where a waiter, even a chef, can quit, suddenly, even by email the day they were to come to work. Our favorite shots from The Furrow and Homestead field team. Living a life of "radical simplicity."